HRA is raffling off 30 guns in 30 days! 1000 tickets will be sold for $30 each or 4 for $100, and each ticket has 30 chances to win! Each day in August, the daytime Cash 3 Lottery drawing will determine the winner for that day. 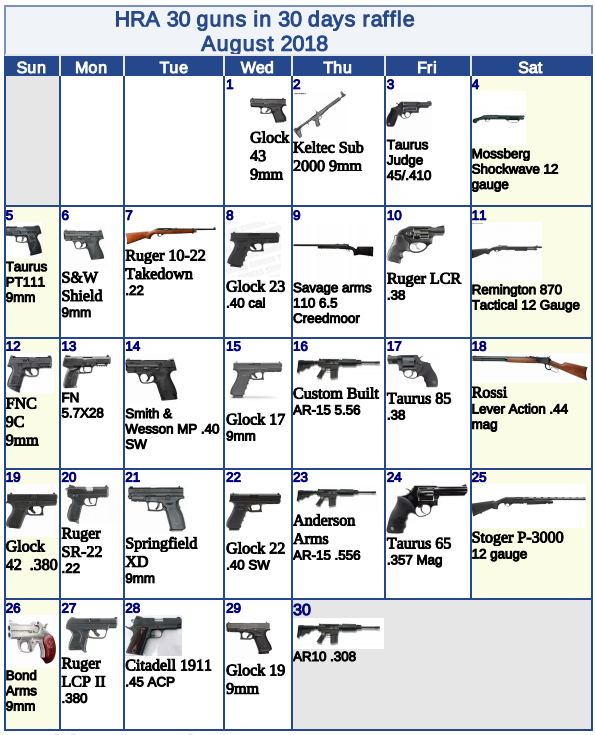 That winner receives the gun listed for that day on the raffle calendar shown below. All guns will be transferred to the winners through a Federally-licensed firearms dealer in full compliance with Federal and State law. Complete rules and a copy of the raffle calendar are available here. For further information contact Jeremy Davis at 828-246-2468 or davisj5717@charter.net.